Mmmmmmmm, doughnuts. Deep fried sweet dough, filled with jam and coated with sugar – delicious! Actually, I have never made doughnuts before – I always tend to shy away from anything which requires deep frying in case I accidentally set fire to myself or the kitchen – but I came across a recipe by Jo Blogs Jo Bakes on Facebook for baked doughnuts (or “Little pillows from heaven” as she rather charmingly calls them), and thought they would definitely be worth having a go with. 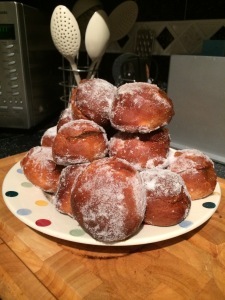 These doughnuts are really very simple to make as well, although it definitely helps if you can use a freestanding mixer with a dough hook to mix and knead the dough as it’s really wet until after the first proving. 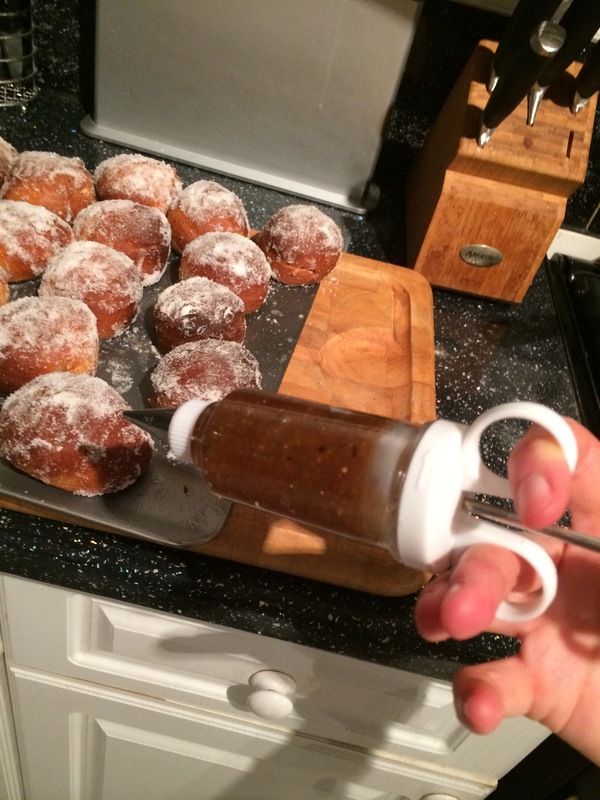 I’d also recommend a piping bag of some description to stuff the doughnuts with jam, otherwise you are really going to struggle with filling them. I had a handy icing syringe which I intended to use, but I discovered it is utterly rubbish and the top kept popping off each time I tried to squirt jam into the dough, so I ended up using a disposable icing bag with no nozzle and that actually worked perfectly. The syringe went into the bin. My doughnuts didn’t rise as much as I’d hoped, but my bake day was the first decidedly chilly day of October and I don’t have a proving drawer like those Great British Bake Off bakers, so I was always going to be fighting a bit of a losing battle on this one. I also got distracted with sorting out my bag and gym kit for work and left the doughnuts in the oven for a tad longer than I should have, which meant they were a teeny bit dry. 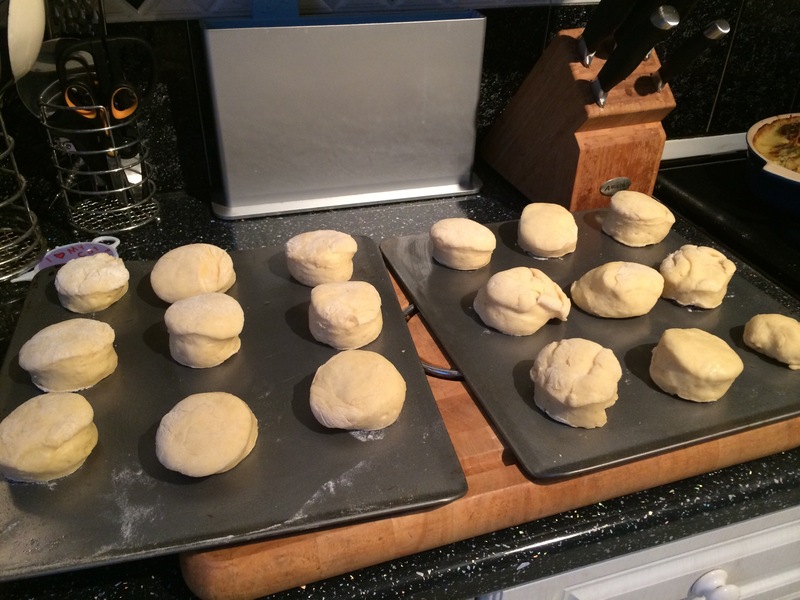 In Jo’s blog post she features pictures of a much paler doughnut, so I am convinced the fault is my own rather than her recipe – definitely give them just 10 minutes to cook, and if they look too pale try 12 minutes, but don’t leave them any longer. 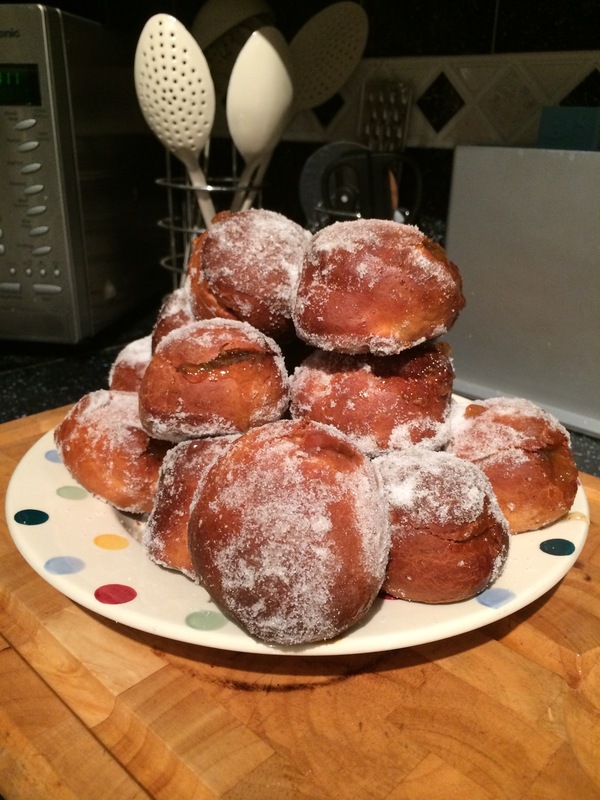 The smell wafting through the house as I baked the doughnuts was utterly delicious – in fact, I think it’s worth making them for that smell alone. When we eventually decide to put our house on the market I will bake doughnuts when we have viewings to give people that warm and homely feeling and they will probably snap up our house! You can read Jo’s recipe on her lovely blog here. I tweaked it a teeny weeny bit (I didn’t add orange and used a different jam), and next time I like the idea of adding a spoonful of custard powder to the dough and filling the doughnuts with sweet stewed rhubarb for a slightly more unusual doughnut. The possibilities are pretty endless though, so feel free to muck around with the fillings … if you have any good ideas, feel free to share in the comments section below. 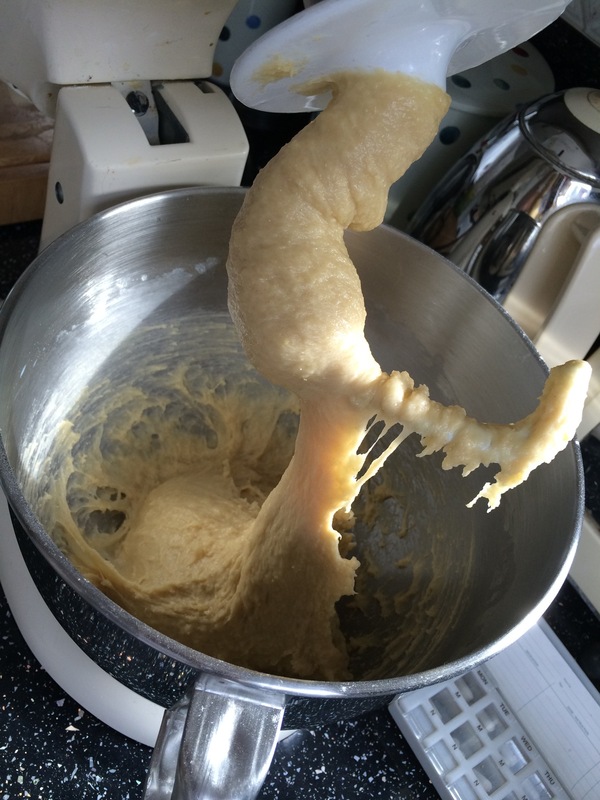 Firstly put the flour, yeast, caster sugar and salt into your freestanding mixer bowl. Put 175ml milk in a jug and heat it in the microwave for one minute and then add 75g butter to the jug and heat for another 30 seconds. You want the milk to be hot but not boiling and the butter to be melted. Mix well and add the milky buttery mixture to the dry ingredients slowly whilst you mix them. 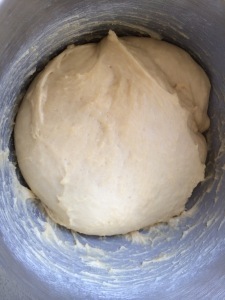 Use the dough hook to knead the wet, sticky batter for 5 minutes until it’s silky and elastic, and then cover it with clingfilm and allow it to prove in a warm place for an hour or so until it has risen. Put your dough onto a well floured surface and knead it for another 30 seconds (it should be like a pillow now! 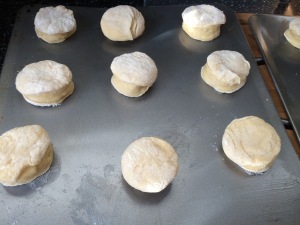 ), then pat it out to a thickness of around 1 inch and use a 6cm round cutter to cut out the doughnuts. Basically they look like little scones. Put each doughnut onto a greased baking tray and then cover with oiled clingfilm and allow to rise again until doubled in size. After two hours of proving mine were not much bigger and I was fed up of waiting so decided to go ahead and bake them in a 180 degree oven. Jo says to leave them for 10-12 minutes in the oven – as I mentioned, mine were a touch overbaked so err on the side of caution and check after 10 minutes. While the doughnuts are in the oven melt 25g of butter in the microwave and put some caster sugar in a bowl. Take the doughnuts out of the oven and immediately brush them with butter and dip them in the bowl of sugar until they are coated. Poke a knife into each doughnut and twist it around to make a little hole, then pipe some jam into each one. I made 18 doughnuts with this mixture and used pretty much a whole jar of jam, which surprised me (I think Jo used a fair bit less jam in her recipe). 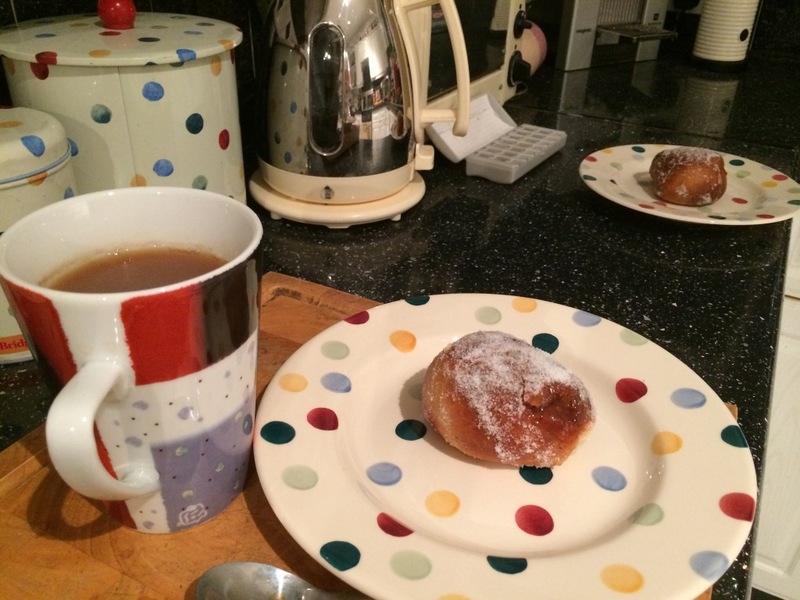 I’m glad mine had plenty of jam in as it counteracted the slight dryness of the doughnut. We ate ours pretty much immediately (honestly, the smell is so amazingly tempting it’s hard not to stuff one in your mouth as soon as you take the doughnuts out of the oven), and I agree with Jo that they taste light and quite virtuous. I’ll definitely make them again (paying attention to the oven timer) and will play around with the flavours. 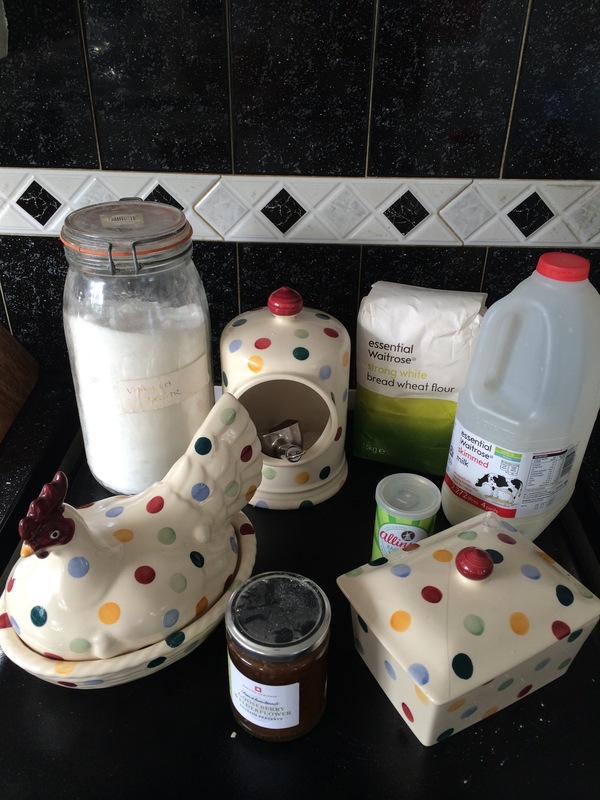 Week 9 of the Bake Off is patisserie and looks complicated, so I have no idea what I am going to make for my next challenge!